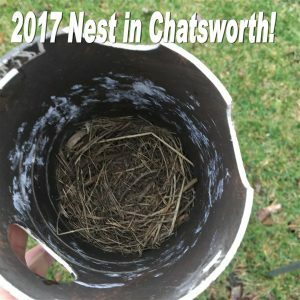 Bluebird Festival scheduled for Saturday, April 8th at 6pm at the Chatsworth American Legion in downtown Chatsworth. Come join us for a pulled pork dinner! Awards and recognition will be given to students and teachers who are building this project! 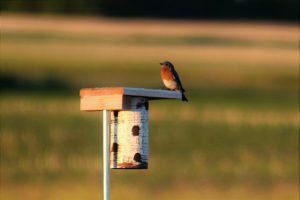 Last spring (2016), our community pulled together and with the help of a donation of 36 bluebird houses and assistance from residents, teachers and students from Prairie Central and Pontiac schools, 115 bluebird houses were installed throughout our area. Corner Hardware in Chatsworth has stocked a special house, the Gilbertson house, which is especially made for the bluebird. Over 150 people attend the Bluebird Festival in March of last year, excited about the prospects of bringing this beautiful bird back to our area. Many more bluebirds were spotted in the area than ever before in the recent years. The community had several nests and multiple babies. It was exciting. This project has been recognized by the JWP Audubon Society and by Angelo Capparella, PhD at Illinois State University. They published an article in their Prairie Winds newsletter and are anxiously waiting for more news about the upcoming Festival on Saturday, April 8th. Since last spring, this project has been publicized throughout the greater Livingston County area. The Cullom mayor has been especially supportive. The Tri-Point schools have jumped on board. With the help of the high school science teacher, Alison Buckley and the National Honor Society students, over 130 houses were sold in the Cullom, Kempton, Piper City, and Cabery area! Students and teachers installed these houses last weekend. These communities are also anxiously awaiting bluebirds! Other communities are also interested – the Fairbury Speedway would like to sell houses with their logo, Cornell is interested, Emington is getting on board, residents from Strawn have purchased houses. Because the Chatsworth high school mascot was the Bluebird, Chatsworth is looking to be named the BLUEBIRD CAPITAL OF ILLINOIS. Students are working on getting a proclamation from Governor Bruce Rauner and are expecting resolutions in recognition for their efforts in this project from both the Illinois Senate and House of Representatives. We believe this project is very educational for our students and all residents alike. It is good for our environment, and certainly has been an exciting project which has brought communities together.